Heat grill. In small bowl, combine basil, 2 teaspoons oil and 1 garlic clove; mix well. Rub on both sides of tuna steaks. Set aside. In food processor bowl with metal blade, combine all sauce ingredients except parsley. Process with on/off pulses until finely chopped, scraping down sides of bowl if necessary. Set aside. When ready to grill, place tuna on gas grill over medium heat or on charcoal grill 4 to 6 inches from medium coals. Cook 8 to 12 minutes or until fish flakes easily with fork, turning once. Serve sauce over tuna. Sprinkle with parsley. To broil tuna, place on broiler pan; broil 4 to 6 inches from heat using times above as a guide, turning once. 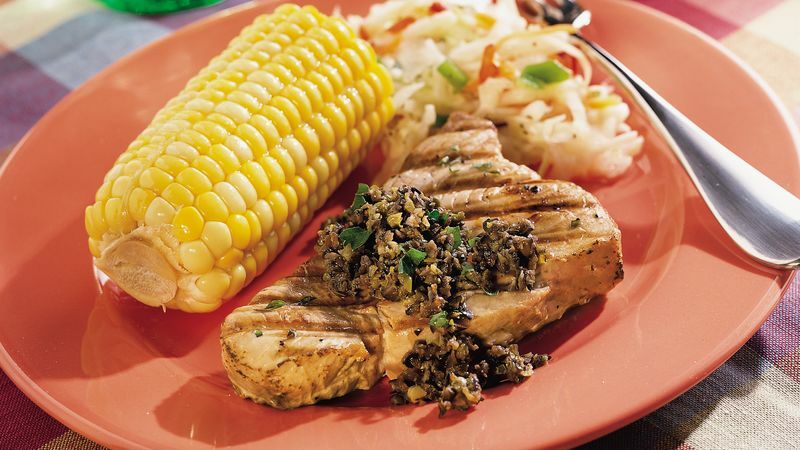 The olive and caper sauce for this grilled tuna features the flavors of tapenade, a classic French Provencal recipe. Used as a condiment, tapenade is a thick paste of olives, capers, anchovies, lemon juice olive oil and sometimes bits of tuna. The olive and caper sauce can also be used for crostini, or as a condiment for meats, poultry or fish. Refrigerate the sauce for up to three days. Fresh or frozen tuna steaks have light- to dark-pink flesh. As the tuna cooks the flesh lightens to a pale cream color. Albacore tuna, primarily used for canned tuna, is the only tuna that can be called white. Prepare the sauce up to three days ahead; cover and refrigerate it. Enjoy this entire with deli coleslaw and corn on the cob.